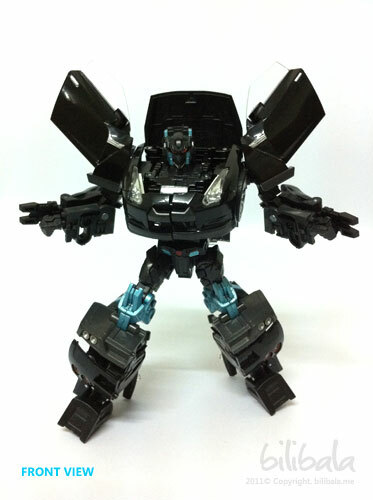 For starter of reviewing TF Alternity, this GTR Alternity Nemesis Prime is actually the 1st series in the Alternity line. It comes with few colors with different name/head piece : Red (just released end of 2010), white (ultra magnus) , Silver and black. Despite the different color they have, they are still using the same body mold, except for the white color version one (which is the ultra magnus) which has a slightly different head piece. 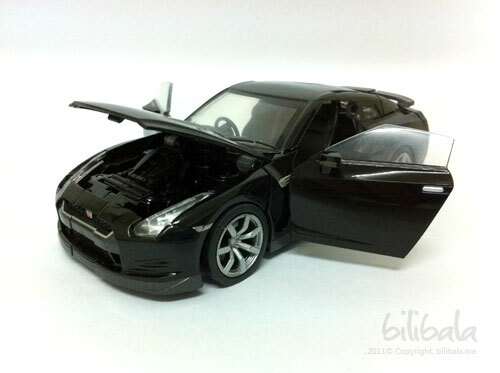 I only managed to get on hold on the black color version GTR one cause i like black colored sport car and knowing the fact, the rest of the body mold is the same, it is better to get the color you like. The 1st impression when having this toy is : WOW, a metallic colored transformer in my life! Yes. The color is of very high quality painting with metallic touch. And you can feel the overall weight is a bit heavy as well despite having the size of a rough 16cm in width and 4cm height. One thing i like about the TF alternity is the quality of parts being used. 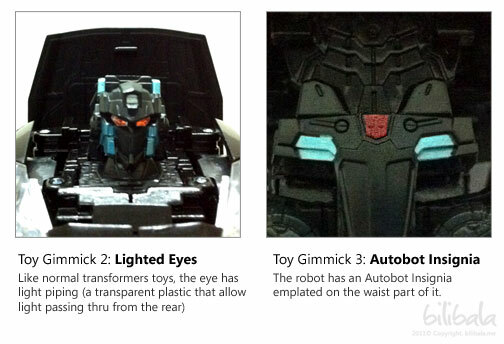 It is under Takara Tomy and as mentioned before, Takara Tomy normally has higher QC on their parts as compared to Hasbro. 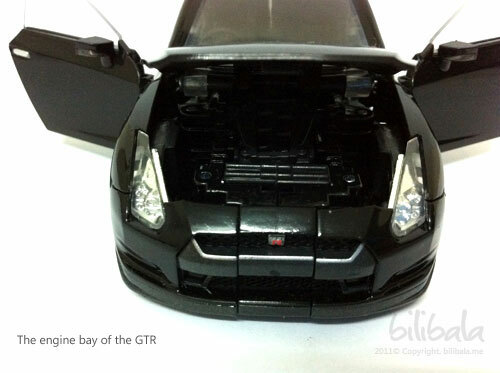 The Alternity Nemesis Prime has an alt mode in Nissan GT-R (R35) . 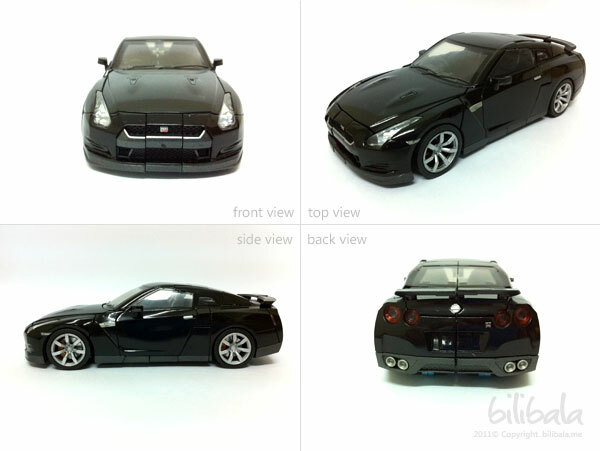 The GTR has a handful of details which i will elaborate below. 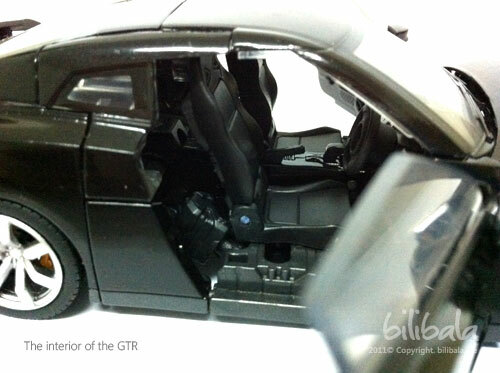 You can actually open both of the doors and the car bonnet to see the interior of the car which is quite a resemblance of those non-transformable car model sold in the market. 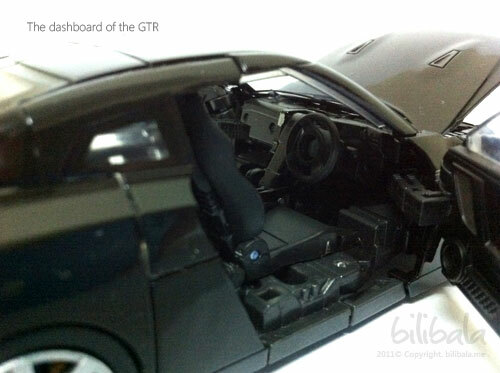 The interior of the car is quite detailed as well, with a dashboard intact with steering and you can actually see the handbrake and seats for the car. There is few other points worth mentioning for the exterior detailing. All the car lights are in transparent plastic which add to the realistic detail of the car. See the above for the front headlights. And below is the rear backlight. 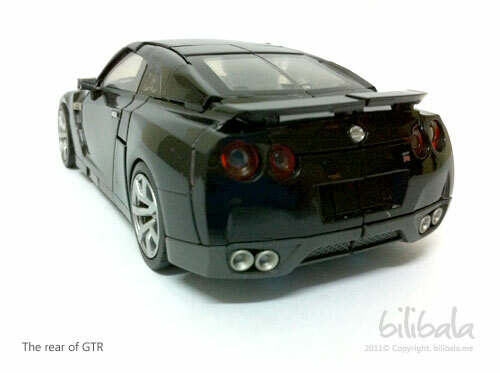 You can also notice the GTR and Nissan logo on the front and the back of the car. 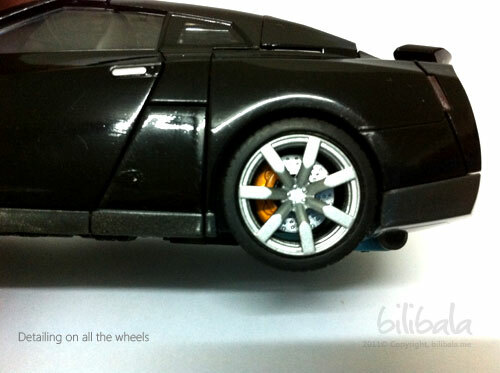 And you can also notice the brake calibers (colored differently) for the wheels and also the tire are in soft rubber and not hard rubber which add to the realistic touch. 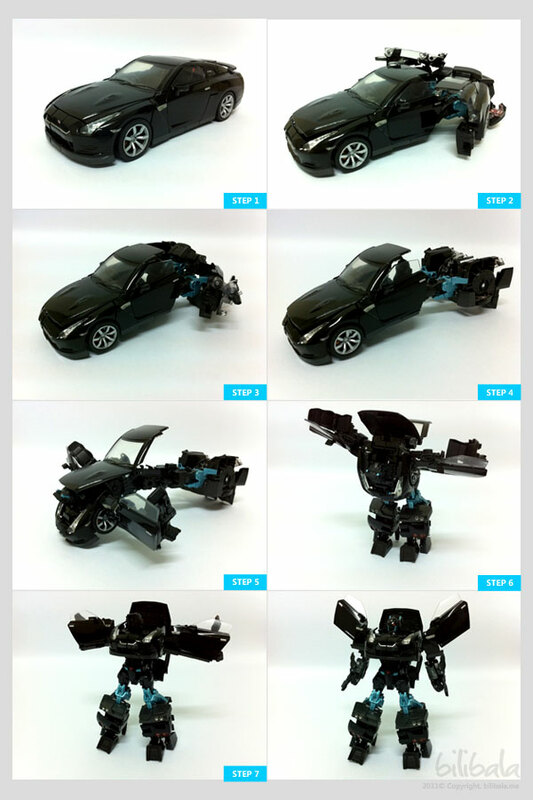 The robot mode itself has 13 points of articulation. 1 x head (ball joint), 2 x upper arm, 2 x middle arms, 2 x hand (ball joints) , 2 x upper leg, 2 x ankle, 2 x lower legs (ball joins). 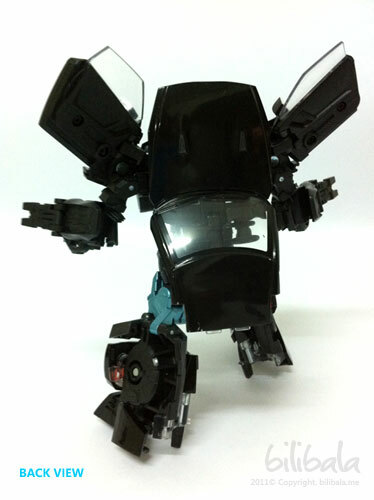 It can actually do medium posture with substantial joints movement. However, the robot itself is quite heavy as the back part of the robot is taking all the weight. Try to think of it as having a heavy turtle shell on the upper part of the robot. With this, i am really having a hard time making it to stand properly without proper leg adjustment to balance up the robot weight in which, is quite a turn off for such pretty robot. Anyhow, i manage to pose it with the posture below for the photoshooting. Believe me, i spent 10 mins balancing and posing it. The transformation process is quite intermediate. There is a part which involves automation in transforming which is quite a cool feature. (*Automation in transforming is meant by moving a part, the other adjoining part will be moved together without having to move 2 separate parts together.) Well, a picture sums it all up. There are a few gimmicks which are being implemented. What i can say about this baby? 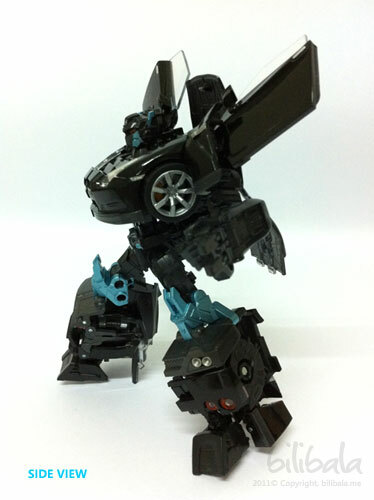 Well, it’s really cool for both the vehicle and robot mode. 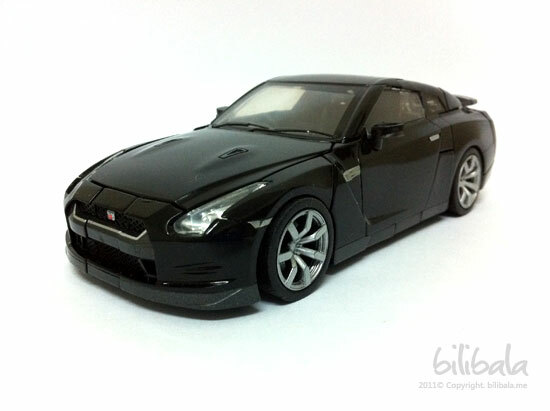 I love the GTR very much and even if you dont like the robot forms, you can always display it as a car model instead. The quality and the paintwork is so far the best among all my Transformers toys collection and it is really worth grabbing one. There’s only one setback for me on this collection: it is quite hard to pose. For those who are interested, sorry to say that the black and silver version of it has already been sold out a year back. They only reissue the white and the red color version currently and they are selling like hot cakes. My advise is: better grab the red one as that’s the main primary color for the optimus (and also not to forget certain part of it is dark blue to match back the optimus color scheme). Nice touch on the close-up shots and transformation sequence. Can almost see it in action as though from animated still shots. Impressive!